Unicast RPF; loose mode is okay. With loose RPF enabled, any route sourced from an address that is pointing to a null destination in the routing table will be dropped. A route to some destination not used in the network pointing to null0. To make things a little simpler we’ll point a route to 2001:db8:1:1::1/64, a route that doesn’t exist anyplace in the network, to null0 on B and C.
A pretty normal BGP configuration. 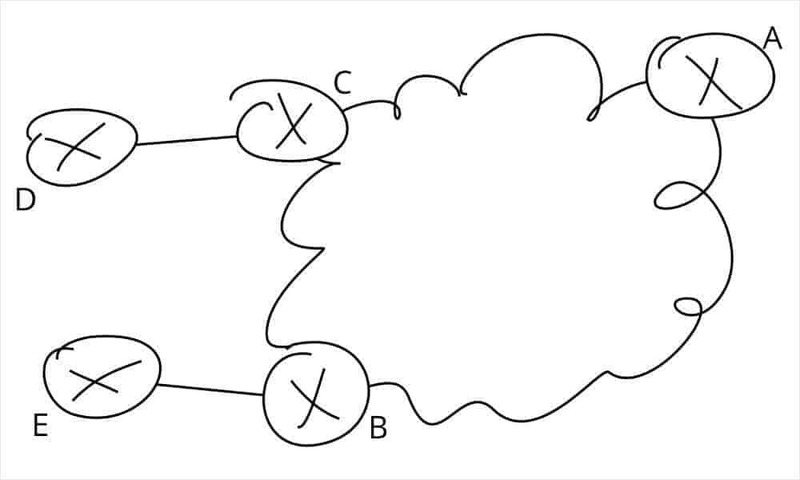 redistribute from static routes into BGP filtered through the route map as described. It’s possible to have regional, per neighbor, or other sorts of “scoped” black hole routes by using different routes pointing to null0 on the edge routers. These are “magic numbers,” of course—you must have a list someplace that tells you which route causes what sort of black hole event at your edge, etc. Note—this is a terrific place to deploy a DevOps sort of solution. Instead of using an appliance sort of router for the triggering router, you could run a handy copy of Cumulus or snaproute in a VM, and build scripts that build the correct routes in BGP, including a small table in the script that allows you to say something like “black hole 2001:db8:3e8:101::/64 on all edges,” or “black hole 2001:db8:3e8:101::/64 on all peers facing provider X,” etc. This could greatly simplify the process of triggering RTBH. Now, as a counter, we can look at how this might be triggered using I2RS. There are two possible solutions here. The first is to configure the edge routers as before, using “magic number” next hops pointed at the null0 interface to trigger loose uRPF. In this case, an I2RS controller can simply inject the correct route at each edge eBGP speaker to block the traffic directly into the routing table at each device. There would only need to be one such route; the complexity of choosing which peers the traffic should be black holed on could be contained in a script at the controller, rather than dispersed throughout the entire network. This allows RTBH to be triggered on a per edge eBGP speaker basis with no additional configuration on any individual edge router. Note the dynamic protocol isn’t being replaced in any way. We’re still receiving our primary routing information from BGP, including all the policies available in that protocol. What we’re doing, though, is removing one specific policy point out of BGP and moving it into a controller, where it can be more closely managed, and more easily automated. This is, of course, the entire point of I2RS—to augment, rather than replace, dynamic routing used as the control plane in a network. Another option, for those devices that support it, is to inject a route that explicitly filters packets sourced from 2001:db8:3e8:101::/64 directly into the RIB using the filter based RIB model. This is a more direct method, if the edge devices support it. Either way, the I2RS process is simpler than using BGP to trigger RTBH. It gathers as much of the policy as possible into one place, where it can be automated and managed in a more precise, fine grained way. Interesting read and use-case for I2RS. If recall correctly RTBH can also be deployed cross AS (often using the community:666) to perform upstream DDoS mitigation (either Source or Destination based black holing). BGP Flowspec can potentially go even further and there was an interesting podcast on packetpushers about FlowSpec: http://packetpushers.net/podcast/podcasts/pq-show-78-bgp-flowspec-dos-mitigation/ (and with the recent IoT DDoS attacks we might see this sooner than later). Based on this I’m curious to know how you see the cross AS functionality with I2RS? Also one thing that keeps nagging at me concerning I2RS is the fact the *GP is not aware of manipulations of the FIB/RIB, it sounds to me this can be a troubleshooting nightmare but maybe I’m just missing the point, so anything you can offer on that area would be greatly appreciated. Thanks for stopping by! RTBH could be deployed across AS boundaries, but I’m not certain many providers would actually allow you to send a community that changes their policy… One of the problems is that communities can’t be authenticated in any way, so it’s possible for one customer to DoS another customer using plain communities. Some providers do accept flowspec communities, however; I assume they’re doing some sort of “vetting” on them before they apply the flowspec rules. The same would apply to I2RS, of course — the I2RS injection could be carried over a secure connection, and be vetted before installation. The routing protocol would, of course, know about changes in the local table the same way it would know about changes made by another protocol running on the same box. The I2RS agent is no different than, say, a BGP process from an OSPF processes perspective. From a troubleshooting perspective, it should be no different than having multiple routing protocols overlapping throughout the network, I would think.